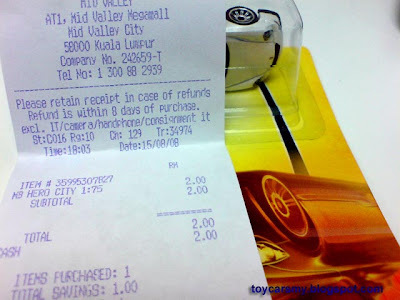 I bought this Matchbox Porsche 911 GT3 last Friday at Carrefour Mid Valley. When I check out, the POS machine display payable amount is RM2.00!! Which is at unbelievable low price. I guess this should be done by mistake, RM2.00 probably is their cost price. I regretted after got home, I should have go back in and buy a few more. I will definitely check back today for other good models. You've gotta be kidding me man... seriously??? The same information was circulated in the forum, when I went back today it is..
i was holdin a white one this morning in the grocery, suddenly i found myself lost in the hardware section...:-) well maybe next week. hehe!